Posted on August 06, 2013 at 9:00:32 am by Lauren C.
Waiting in a hospital setting for a loved one isn&apos;t always pleasant. The good news is our local hospital systems make the wait a little more comfortable, with their amenities. Here&apos;s what you can expect: Parkview Regional Medical Center (PRMC) offers the following: Ronald McDonald House: Fort Wayne is home to one of only twelve in-hospital Ronald McDonald Houses in the world. Locally, you can find one inside the Parkview Regional Medical Center. The Ronald McDonald House provides a home-away-from-home for the families of ill or injured children hospitalized at Parkview. 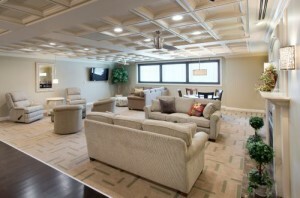 The House features 11 guestrooms, a large kitchen and dining room, a gathering room, laundry room and computer area. While staying at the House, families also benefit from grab and go breakfast and snack items as well as evening meals. There is never a charge to families to use the Ronald McDonald House. Ft. Wayne Farmers Market: Through a partnership with Ft. Wayne’s Farmers Market, PRMC offers a farmers market every Tuesday from 2-6 p.m. The market is set up adjacent to the Parkview Family Park and will run through August 27, 2013. Dining: Family and friends are welcome to eat at the PRMC cafeteria, which boasts a variety of offering. That means freshly baked pizza, impressive salads, and even a gelato bar! You might actually look forward to hospital food! Family Park: The Parkview Family Park offers walking trails, a scenic water view, covered picnic area, safe play equipment for children and fitness equipment for adults. The park is pet-friendly and open sunrise to sunset. Lutheran Health Network, which includes several facilities in Fort Wayne, boasts the following: Walkability: The St. Joe campus is centrally located and within walking distance of many downtown destinations. The Dupont campus features the Dupont Sport and Fitness Park with a walking loop and an expanse of open field for multiple community activities. The Lutheran campus features the .7 mile “Lutheran Loop” that was constructed in 2008 to help connect Aboite New Trails to the Rivergreenway via the historic Towpath Trail. A large section of the Lutheran Loop is lined with trees and it is regularly used by walkers and runners. Mad Anthony Hope House: The Mad Anthony Children’s Hope House opened on the Lutheran Hospital campus in 2003. This nonprofit hospitality house for families of children undergoing medical treatment at any Fort Wayne hospital, and is currently undergoing an expansion. The facility provides shelter, meals, and laundry. In return, guests are asked to pay a nominal charge of $10 a night, but the fee will be waived if they cannot afford it. Dining: One of Dupont Hospital&apos;s most popular additions has been the build-your-own breakfast sandwiches. Patients and guests get their choice of egg, meat, cheese and bread. The Tree House Café, located between the famous Lutheran Children’s Hospital Tree House elevator and the south lobby, is another draw. Different vendors such as Moe’s Southwest Grill, China Buffet, Panda Express, Mancino’s, Papa John’s, Fazoli’s, Bagel Station, Subway and Bandido’s set up shop during lunch and dinner hours on a rotating basis Monday through Friday to complement the already popular selections in the Garden Terrace Café. Hospital staff will do their best to ensure you feel right at home. Whether you&apos;re waiting for a few hours, or days, take advantage of what Fort Wayne&apos;s hospitals have to offer.